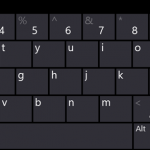 Set “Make the standard keyboard layout available” to ON. Finally, after hours of searching someone helps point out the obvious. Kudos and thanks!